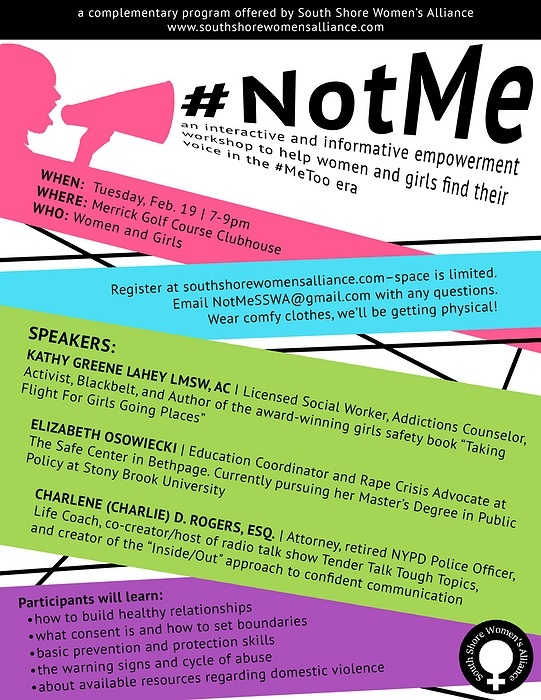 Subject: LongIsland.com - Your Name sent you Event details of "#NotMe: An Informative & Interactive Empowerment Workshop"
Please join SSWA for this important workshop which includes expert speakers - to empower women and girls to gain the confidence to use their voice and actions to stay safe. A great mother-daughter night out! Dress comfortable - we'll be getting physical. Space is limited, early registration is encouraged. Kathy Greene Lahey, LMSW, AC | Licensed Social Worker, Addictions Counselor, Activist, Blackbelt, and Author of the award-winning girls safety book "Taking Flight For Girls Going Places"
For questions, please contact: NotMeSSWA@gmail.com.